CANNA Coco Professional is an organic product that is very lightly buffered and free of harmful viruses or soil diseases. CANNA Coco Professional has an excellent water/air system, that provides the ideal circumstances for this cultivation method. CANNA Coco Professional can be used a number of times. 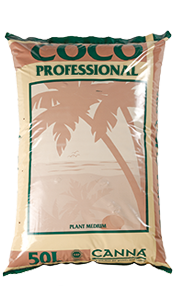 CANNA Coco Professional is manufactured in the same way as CANNA Coco Professional Plus. CANNA Coco Professional consists of 100% coco flakes, produced in India while processing coconuts. The production process is subject to strict quality controls so we can vouch for this product’s quality. The buffering of CANNA Coco Professional is not as heavy as CANNA Coco Professional Plus. Meaning that you have more control over the buffering process and have more influence on the growth and bloom of the plant. All in all, this is a CANNA worthy product. Just not as easy to use as CANNA Coco Professional Plus. The choice is yours which of the two you prefer! CANNA Coco Professional is a quality product that meets strict horticultural standards. The purity of the raw materials used distinguishes it from other substrates based on coco. CANNA Coco Professional consists of 45% wood cellulose which ensures that the physical characteristics are retained for a long time. The water/air ratio is 73%/23%. In addition to this the medium offers ideal conditions for cultivation because the coco flakes are rinsed and buffered. This enables the plant to develop quickly from the start of cultivation. Use pots of at least 5 litres. The larger the pot, the more constant the root environment will be. If you use CANNA Coco Professional substrate in combination with the fertilisers from CANNA’s COCO range designed for this purpose, then you are investing in quality and certainty!